Since 1998, Pastore's has been serving fresh hearth-baked pizzas and a wide variety of wings, subs, wraps, pasta, salads, as well as many finger foods. We would like to thank all of our loyal customers in LeRoy, Stafford, Caledonia, Pavilion, Bergen and surrounding towns in Genesee County, for making this our 20th year in business. 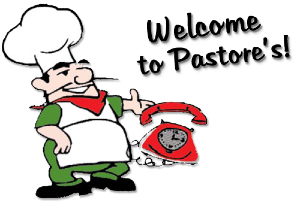 Pastore's Pizzeria is committed to offering the best selection of the highest quality products and the best customer service available. We will always listen to our customers and we will always look for ways to improve our product. Our menu will grow and change as our loyal customer base grows and changes. We will only be satisfied when you are. We would love to hear from you!